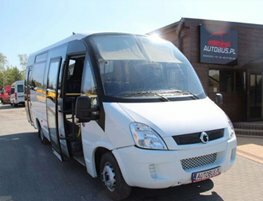 If you are looking for a 24 seater vehicle during your time in Chesterfield, look no further than us here at Chesterfield Minibus Hire. We have everything required to promise you a great experience from start to finish. With reliable vehicles and high-quality service guaranteed, we are definitely the right company for the job. A space-saving design is used on board to ensure that all passengers are comfortable and have as smooth of a journey as possible. There is also air conditioning, an entertainment system and more. With plenty of space for luggage, our 24 seater is ideal no matter what the occasion is. All vehicles go through rigorous testing on a regular basis to ensure they are safe and they are also between 2-4 years old. Our drivers know the area of Chesterfield really well, so there is no need to have concerns about getting lost. You can get in touch with us right now for a quote/to make any queries about this vehicle or any other one. Whether you are going on a hen night, a birthday party, a business event or something else entirely - we are confident that our 24 seater minibus can deliver. Choosing Chesterfield Minibus Hire will allow you to see the market town in style.